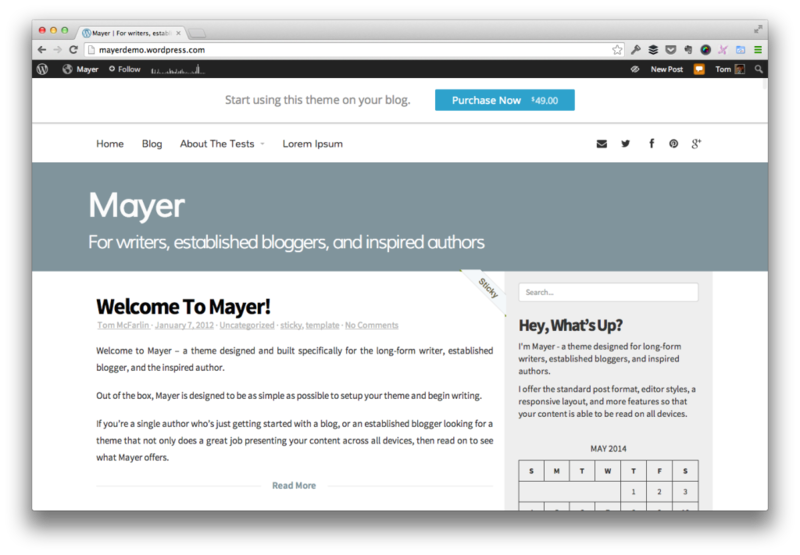 For the last few months now, I’ve been selling Mayer exclusively on WordPress.com and I’ve really enjoyed it. The thing is, for those that have kept up with the work I’ve been doing with WordPress over the past few years, you know that I’ve been involved in the development of several different themes (and still am, but more on that later). But in working exclusively with the marketplace, there have been a number of questions that I’ve been thinking about as it relates to marketing WordPress.com themes. Generally speaking, I don’t have answers to these, though I’m happy to share my thoughts; however, I’m definitely interested in hearing your thoughts and opinions as well. How do you add longevity to WordPress.com themes? How do you retain the same audience and customer base without feature bloat? How do you avoid alienating your original customer base? Three relatively simple questions. At least, I think so. I have my thoughts on each of the above but, again, their just thoughts – what I’m really interested in is the thoughts and perspective each of you have as it relates to doing something like this. But first, I might as well share my opinions on all of the above. Adding longevity to a theme refers to the idea of keeping customers satisfies, excited, and happy that they’re using your product. When we first ship our theme, I think that we should be focusing on a strong 1.0 so that we’re able to have a healthy roadmap of features that will continue to add benefits and excitement to the theme as it continues throughout its lifetime. But how do you get the average WordPress.com user to stay excited and aware of all things that are going on with the theme? By that, I mean how do you keep them aware of, say, your product blog, or how do you let them know what things are currently in the works. I realize this requires a bit of creativity, but as it stands right now, it seems like it’s much more difficult to do that within the WordPress.com marketplace than when you’re managing inventory in your own shop. But we see this in numerous places both offline and online: Sometimes introducing new features, a new design, or even removing old features in place of something new. Sometimes this results in feature-bloat, sometimes this results in frustrations. I cannot stand the mentality that comes with saying that constantly packing in features adds value to a product. I usually take the opposite stance: I think it devalues a product’s identity. With that said, how do you continually give a product a lifetime when it has a strong identity and, thus, a minimum amount of features that can continue to strengthen said identity? Or is that possible? Finally, the last thing that any company wants to do is to alienate customers. Instead, we should want them to have the best experience possible when working with our products. This is why I believe in having very narrowly defined options, theme settings, and a mission and vision for a theme (or plugin or what have you). So each time you introduce something new that could potentially devalue the original identity of the product, you’re handing your customer something that they did not buy. And because of the market, they are able to select another product that solves whatever problem they are currently facing. Of course, that’s fine! It’s the nature of the free market, and I welcome that, but the flip side is that we should also want to retain those customers. Not only that, we should want our products to have a gravitational pull on other people to leave what product they’re using to come to the one we’re offering. But how do you simultaneously continue to build features into a very narrowly defined theme with a specific mission and vision, attract new customers, retain existing customers, and avoid alienating old customers? As mentioned, these are just a few of the thoughts and questions that I’ve had over the past few months since I’ve been selling Mayer, as I’m preparing to get ready to sell another theme. The above are obviously my own thoughts and opinions but, as I said, I’m definitely curious to hear what you guys and gals have to say about all of the above. So please leave some feedback in the comments – I’m all ears! Solid advice even for the “self published” theme store. I’ve read a bit of chatter from longtime theme shop owners either getting out of the “game” or claiming the market is getting harder. To that I say, what did you expect? When you see nothing but up and to the right curve growth and life changing passive income — expect things to change at some point. If you’re not looking to reinvest into your product or longevity as you put it, you’re doing it wrong. And you nailed it by reminding us not to alienate customers or other vertical of opportunity. Surround your existing product with other services or the ability to repurpose methods to another product/vertical/offering. I don’t have to remind you about putting all your eggs into one basket. Welcome it and start to run your business is a competitive way. Don’t worry about it too much. Focus on your work, doing a good job, and marketing it well, and focus on customer acquisition. Yes, it’s important to pay attention to the competition but not to be dissuaded by them or deterred by them. Although specific to a WP.com theme shop, these questions all essentially ask how to build a sustainable business given the market dynamics and constraints and all that jazz. And that obviously falls into the marketing realm. Sustainability (not the tree-hugging kind; the longevity kind) is a/the golden egg. But the answer(s) are of course going to be different for any type of business, and then within that group for specific businesses/theme shops, depending on their marketing plan. But generally, innovation, client communication, differentiation, product positioning, relevancy and savvy marketing are the short answers. And in order to not write a comment that totally dwarfs your post in length, I’ll just add some quick thoughts to those concepts. Keep in touch with your customers and let them know they are appreciated. Survey your most loyal customers what they want and don’t want via your email list(or however they prefer to be contacted). Do testing as to what features are a turn-on and what are turn-offs before making big commitments. That’s not just for the product itself but your pricing model, website UX, and anything else that impacts your conversion rate. Data analysis is important. And more important is making sure you have GOOD data. Bad data is death. Reduce client risk. Reduce client distractions when they’re comparing your theme to your competitors. Keep an eye on your competitors and their mistakes and successes. That’s not to copy them, but to see what makes your audience tick and get excited. And to see what they hate and why they leave your competitors. Answer that and you have some relatively low-hanging fruit in front of you. The bloat problem you mention of adding more to the theme to increase it’s value proposition, is that what you’re doing is adding to the associated effort that the client has to put in to extract that extra value. At some point it’s just not worth it to them and more features will decrease your conversions as paradoxical as it seems. So you’re right on- less is often more. Innovation is the biggest trick to sustainability, shared with relevancy. With relevancy, you’ll have to tailor your theme to your target market, or tailor your audience to your theme. The best marketing is word of mouth, which is also the most elusive. Gravity Forms has it in spades and would be a good case study. Get clients to champion you and your products and that’s when your brand begins to take on a life of it’s own. It’s a lot easier to nurture that life when you have an army willing to help you. Anyway, those are a few thoughts on the matter. Agreed! There’s so, so, so much more than goes into the work than simply launching the product and hoping it makes money. You can to consistently stay invested in it. This never bothers me so go right head :). Thanks a ton for the opinions – always valued.